Leading Australian distributor of audio, lighting and staging systems, Jands presents a new ceiling tile loudspeaker designed to deliver JBL sound quality in a wide range of applications. Introduced by HARMAN Professional Solutions, the global leader in audio, video, lighting and control systems, the new JBL LCT 81C/T ceiling tile loudspeaker is the latest addition to JBL’s broad line-up of in-ceiling loudspeakers. Designed for simple installation, the loudspeaker can be easily laid into a 2’ x 2’ US-style suspended tile grid ceiling without any need to cut or modify the ceiling tiles. 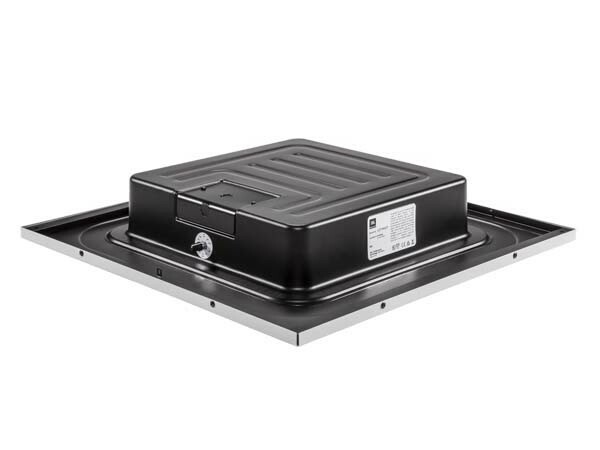 The shallow profile of the JBL LCT 81C/T makes it an ideal fit for applications such as in older buildings with low ceiling decks or in spaces where the above-ceiling areas may be obstructed by pipes or ducts. The LCT 81C/T delivers class-leading high output and sensitivity, and exceptional voice intelligibility for paging systems, airports, retail stores, classrooms, offices, courtrooms, meeting rooms and more. According to Rick Kamlet, Senior Manager, Commercial Loudspeakers, HARMAN Professional Solutions, the LCT 81C/T was introduced in response to the demand from audio installers for a compact full-range ceiling speaker that easily lays into a ceiling tile grid system, while providing enough output and clarity to cover a large area. Key features of the LCT 81C/T in-ceiling loudspeakers include an 8-inch dual-cone driver with 1-inch voice coil providing high quality sound; extremely low profile depth of just four inches allowing installation into shallow-depth ceiling locations where other ceiling loudspeakers do not fit; built-in 10W transformer allowing use on 70V or 100V distributed speaker lines, or alternatively, the speaker can be driven directly by a low-impedance power amplifier (at up to 20 Watts continuous average pink noise; 40 Watts program power); convenient rotary switch on the side of the rear enclosure provided for adjustments; built-in perforated white grille; and UL 1480A and UL 2043 certifications ensuring code compliance. The LCT 81C/T features 96dB sensitivity, maximising sound levels and reducing costs by allowing installers to use smaller power amplifiers. A 100-degree conical coverage pattern ensures excellent speech intelligibility over a wider area, providing adequate coverage with fewer speakers, and saving time and money during installation. The LCT 81C/T expands upon a long line of JBL in-ceiling loudspeakers by seamlessly fitting into industry standard drop-ceiling grids. This form factor makes it easier and more cost-effective for installers working with suspended ceilings.